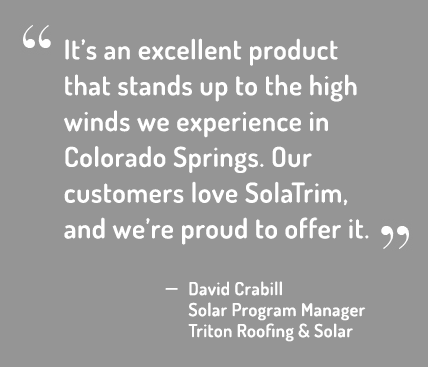 Triton Roofing and Solar has been selling customers on SolaTrim’s protection and beauty since the company first saw the product at a Solar Industry trade show. They found it challenging to sell solar systems as some customers voiced objections that the solar panel array was not attractive and others had heard about the problem with pigeons and other pests nesting under solar arrays. Options to combat the problem were limited, and those installation companies that were using chicken wire to prevent pests from gaining access only added to the problem. Triton was surprised how easy it was to upsell customers once they saw how finished and aesthetically pleasing the solar array was on the roof with SolaTrim. They recognized that it not only provided protection, but added curb appeal to their homes. Many customers thought of the SolaTrim product as an insurance policy against pests, and Triton found that referrals actually increased once customers added SolaTrim to their purchase.